May has been a busy month for racing, with two races scheduled. The first adventures were in Redding-land. The annual Shasta Race was held the first weekend in May this year, and we all made the trek up. Half the team decided they would drive up Friday night to be refreshed for the race. The other half of the team drove up the morning race and would stay over after the race if it ran late. After a four-hour drive, we stopped for dinner and a couple of glasses of wine then made our way over to the hotel that was reserved for us. The hotel was an adventure all of its own. I have camped, in the woods, in the dirt, in a tent, in a cleaner environment than our first hotel room. There were multiple events planned in the county, besides the race, so every hotel and casino nearby was booked for the weekend. There were few spare rooms available so changing hotels at such a late hour on Friday night was impossible. Needless to say, we weren’t comfortable enough to get much sleep, so the day of the race was a long one. We had brunch with the arriving race team as well as my family before everyone headed to the track. 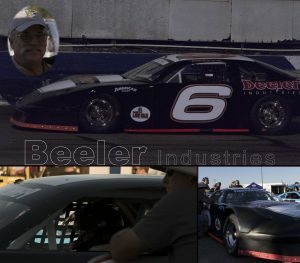 Last years Shasta race had Mike Beeler out with an engine loss, before the first half of the race was reached, leaving the way open for our friend and teammate Tracy Bolin to take the lead and ultimately win the race. This year, Tracy was taken out in a wreck, and Mike ended the race in fourth place. Everyone decided to make the long drive home instead of risking a night in the hotel we had already given sketchy reviews of, including the Beeler’s who graciously gave us their room for the night since they would not be staying in it. Their hotel room while still a 2 star at best, was a vast improvement over the one we had spent the previous night in. We will be forever grateful. 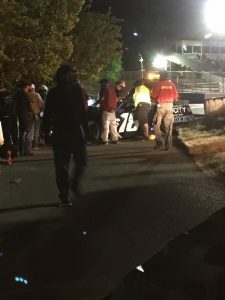 Photo of the #18 car crashed into the cement barrier in the exit lane at the Shasta Track. It gave us a decent nights sleep to be able to have breakfast with my family the following morning. 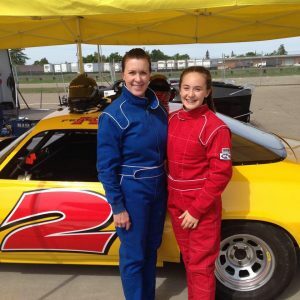 The following race was in Stockton, where one of the four races had Kelly Fensler and her daughter Kayci driving in the bomber series race. 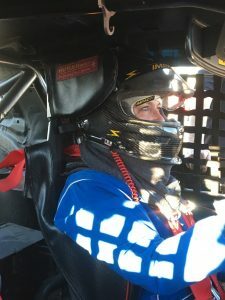 That was a blast to watch, and my first time getting to see Kelly behind the wheel. It was fantastic and fun. Her parents were on hand to cheer her on. 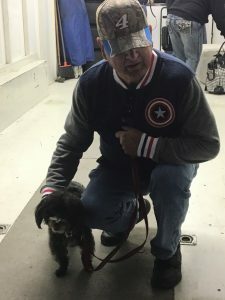 The family and friends of the Beeler’s came to watch Mike race, Anna VanDuyn Webb, Vicki and John Costa, and Mike Beeler’s father and step-mother sat in the stands with Becca to cheer Mike on. Vickie’s brother Eric Conger joined us to stand in the center of the racetrack with the various pit crews, and took some amazing photographs while he watched the cars zoom by us. It is a unique experience and we were thrilled to be able to participate in that. 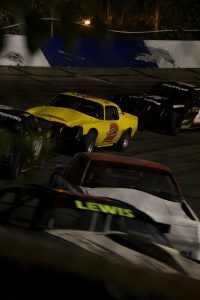 Once again Tracy Bolin was damaged in a wreck and unable to finish the race, while Mike finished in the 4th place position after two ridiculous restarts and the officials bumping the first two cars back. It was another crazy, action packed race, and we look forward to the next one.